Nothing others do is because of you. What others say and do is a projection of their own reality, their own dream. When you are immune to the opinions of others, you won’t be the victim of needless suffering. This lesson was one of the most difficult for me and I believe most others as well to learn. The fear of criticism is one of the greatest fears. That is why people would rather die than speak on stage. I used to be petrified to speak in public. My voice would crackle and my body would shake from fear. However now I absolutely love it! By facing your fear, it will loss its hold on you. If people criticize you for doing something that isn’t to their liking, it’s their issues, not yours. They owe it, not you! Be true to you and give no attention to the people how put you down. Give your best, be your best and let the rest fall away. Own your power!!! When everything is going smoothly in my life it is beautiful thing! I love when my day feels like a warm soft breeze on a summer day. However when the weather changes, some days can feel like a hurricane with 90 miles per hour winds. It can seem like I have a million important things to do in one day. The pressure can feel overbearing!! When I am able to stay calm under pressure, I know I have really become the captain of my ship. But I still have moments when the seas get really rough that I forget how to navigate back to my serenity. However the time lapse is less and less. How about you? How do you react under pressure? Your true character is revealed under pressure. It can either make you or break you! Through experience, tools and techniques, I now know how to take responsibility for my actions rather than react hastily under turbulence conditions. So, although the conditions might change my temperament will remain the same. 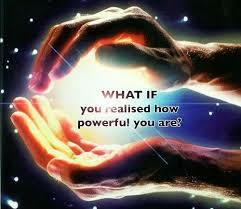 It is time to take back your Power and become the master of your life! Do you want to know how? Call me today and learn how to navigate your life through the storms!!! I love reading inspirational books. Many of my books have the word power in them. The Power of the Subconscious Mind, Power verses Force, Your Invisible Power, The Will to Power, Power Through Constructive Thinking, and the list goes on. The power that is refered to in all of these books is our ability to create our lives the way we choose. We have an infinite supply of energy that when we learn how to tap into this reservoir, will provide us with unlimited power. It in not power to control anything or anyone. It is empowerment. It comes from within and can never be taken away from us once we learn that it is comes from an infinite source. It begins with our thinking. Our thoughts can elevate our lives to heights we can dream possible or take us down into the depths of despair. Thinking is the highest function we are capable of. When we open our minds and hearts to this awareness nothing can through you off course. Yes, you will have set backs, however you will know that these are temporary when you keep your thoughts focused on your vision. You will be able to navigate uncertainty with faith and courage. We are living in times of great chance. These times call for empowered people with a vision of hope, love, and peace. Become empowered by going within the depth of your soul to discover your power to help change the world. Visit my website http://www.monicabennett.biz to learn more of how to become an empowered warrior. The universe loves action! There is no attraction without the action. So set your sail, and start your New Year with a New You! Happy, Healthy and Blessed, New Year to all! Miracles happen every day. They are all around us, at all times. You have to be open to receive them. You have to believe that they are present. Miracles are in our thoughts, our connection to infinite intelligence and in the spaces of the universe. 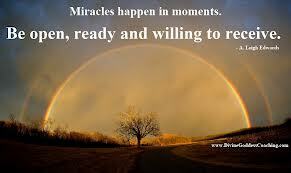 What miracle do you want to see in your life? You must fully believe in its presence without any doubt. Do you desire a healing? It is there. Do you desire peace of mind? It is there. Believe that a miracle can happen. Take all your power and will and focus on what it is you want to happen. The universe will begin to mold and make this miracle for you. This is the season for miracles. What if we collectively believed in world peace? Really, put down our judgments, fears and anger and focused all our energy on this. Do you believe it can happen? If you do than it can. If you don’t, you don’t believe strong enough in miracles. It must be 100% believe, not 99% for the miracle to occur. Whatever miracle you are looking for, believe that it is already present, and be ready to receive. Happy Holidays.